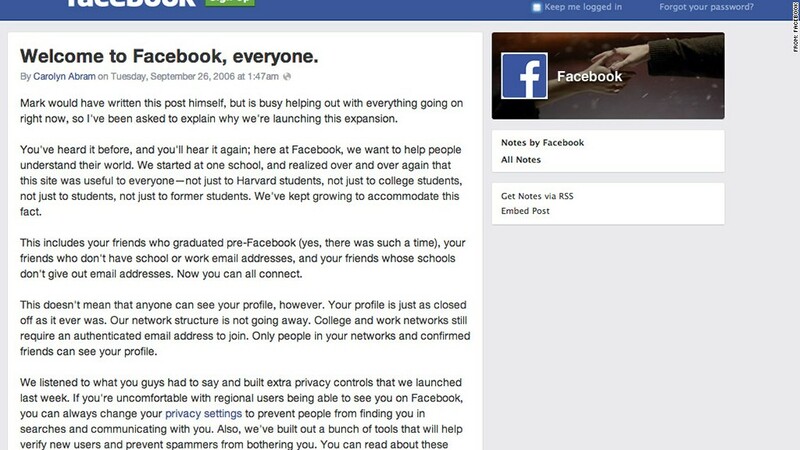 When Facebook (FB) opened its doors to the public on Sept. 26, 2006, millions of existing Facebook users felt like they had been invaded. In Facebook's first two years, large and active networks of college students carefully crafted their online personas with photos of keg stands, inside jokes on friends' walls, and the "it's complicated" relationship with their roommates. Every college network represented a closed-off safe haven. College students had already freaked out over the introduction of News Feed, and then all of a sudden, parents, siblings, neighbors and potential employers all had access to their worlds. For the first time, privacy became a major concern for Facebook. Facebook quelled many initial fears by introducing privacy settings, but figuring out who could see what on your profile was never easy. Trying to change it required a Ph.D.
Over time, Facebook has made not-so-subltle changes to open up your profile to the world, creating an ever-changing battle over privacy in the process.